Flexible and versatile healthcare barcode label maker utility is a helpful tool to generate business barcode labels and tags in attractive and cost effective manner. Software has advanced features and functionality to print barcode label with background image, photo, and to make colorful barcode tags. Software allows the user to create barcode label in 2D and linear font standard. Successfully running healthcare barcode label maker provides the facility to the user to design barcode in various shape and size including rectangle, ellipse and other similar shape. Company facilitates a free download trial version of the program that is helpful to simply understand the features and functionality of the software before ordering complete program. 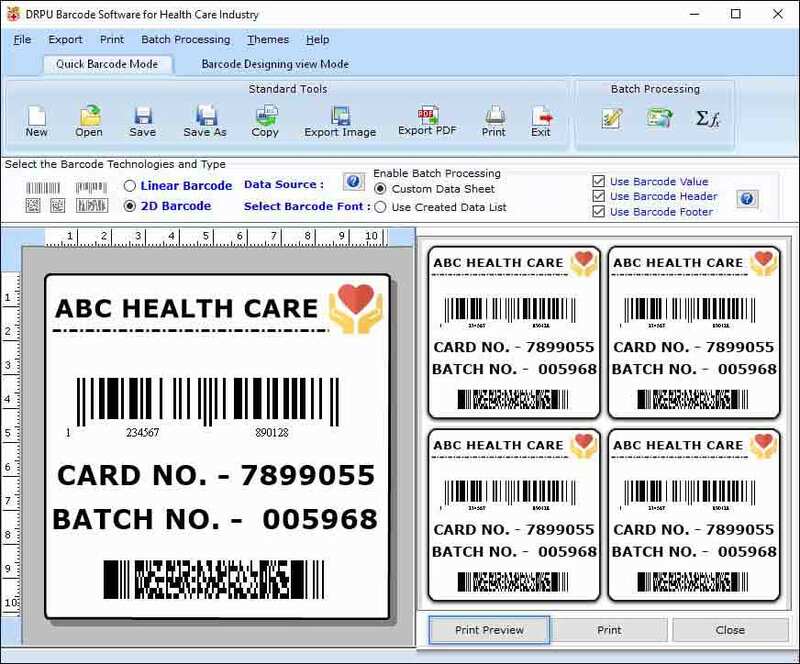 Hospital barcode inventor software permits the user to print numerous copies of same barcode labels and tags in single paper in minimum time. Powerful hospital barcode label maker software is helpful to any medical industry to manage its large number of product production and helpful to minimize the risk factor. Technically advanced barcode label maker software is a comprehensive tool that can easily and smartly design high resolution barcode labels in cost effective and attractive manner. Extraordinary features: * Best hospital barcode label maker software is a reliable solution to make barcode tags and images effectively. * Software is suitable for common health care industries for labeling healthcare equipments, tools and medicines quickly. * Healthcare label maker software supports all major barcode scanner and printers to print barcode image and stickers. * Software is a helpful tool to improve the healthcare industry processes. * Utility provides various designing tools like line, pencil, arc etc that are useful for creating professional barcode image. * Utility is capable for design best quality 2D and linear barcode labels for healthcare industries for labeling the products in simplest way.